I am pleased to provide a 5 star review. Kevin is very responsive and customer friendly. I had him go out to my rental property to look at some carpet that needed cleaning. The tenants really messed it up good. Kevin advised that due to overall condition, I would be better off replacing the carpet. He recommended a good place to call that he regularly does business with. I called them and they took good care of me, got me what I wanted. Kevin would not accept payment from me, even though it was offered. Time is money, but Kevin just wanted to help and would not take any money from me for his valuable time. Class act. Thank you Kevin! WOW!!! Great price, superquick, efficient, really friendly, great great work! I needed my stairs hallway and two bedrooms carpet cleaned and they got here in about 30 minutes finished in about 45 minutes and it looks amazing!!! I will admit, I almost thought I called the wrong number when Kevin first answered the phone and I felt a bit uneasy about the appointment. BUT I learned Kevin is just very straight to the point and focused on his work. Everything was perfect! I had a carpet repair and 3 rooms cleaned. The repair was scheduled first and done by one of Kevin’s employees. He did a fantastic job and was very quick! Kevin came the next day for the cleaning. He was early for my appointment, got the rooms cleaned super fast and the carpet looks/feels brand new! Price was reasonable as well. Super happy, highly recommend and will totally use his services again in the future! Thank you, Kevin! In the process of getting my house ready to sell and needed my carpets cleaned. I was actually concerned I may have to replace a carpet in one room due to pet stains. Fred arrived on time, made the estimate and then did an excellent job cleaning my carpets. All the rooms looked great and I was pleasantly surprised the room with the pet stains looked great as well. Highly recommended. Will use them in the future. This was the first time using Ace. Tyler and Anthony came out promptly as scheduled. Both were extremely nice, very knowledgeable and confident explaining the price and scope of their work. I was impressed by the different apparatuses they had to remove some of the stains. We delayed cleaning our carpets due to ongoing health issues of a family member. Some of the stains appeared to be permanent and some of the shadow stains where foot traffic was heaviest never came out a few years ago when cleaned. To our surprise all the stains were removed. I attribute this to Tyler and Anthony’s reluctance to stop trying to remove the heaviest stains. They kept reworking these areas until they were satisfied never. The result was amazing. My wife and I are so thrilled by the hard work of Tyler and Anthony. Thank you for doing such a miraculous job restoring our carpet! 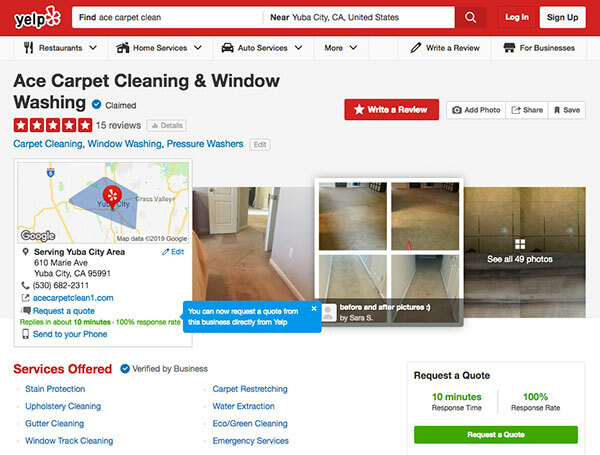 You can view more customer reviews for Ace Carpet Cleaning & Window Washing on our Yelp listing.